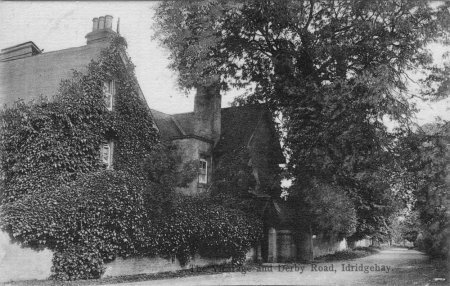 On the back is written: Ithersay House, Idridgehay, Derby - Home of Uncle (great) David Sibbald & Aunt Mary. Destroyed by German land mine Dec.1941. In 1930 I (Stanley L Taylor) drew a sketch of the corner window - left of photo - hung in Ithersay House until its destruction now at Nellie Sibbald's. Nellie Sibbald was wife of Fred Sibbald. They lived in Yorkshire. Undated, but figures enlarged (see elsewhere) indicate pre-1914. Addressed to Mrs Baldwin, 45 Crewe St, Derby. From L.H.Riley at Carr Hall, Turnditch. Posted 1911. 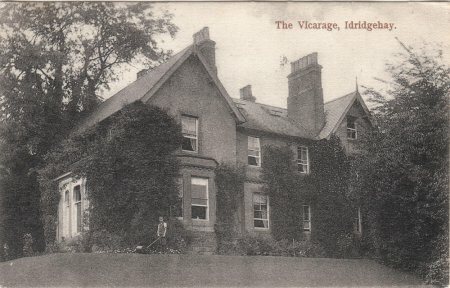 "The Vicarage, Idridgehay", from Ernest B., Ireton Wood to Miss A. Walkington, Newborough, Burton-on-Trent. A boy is mowing the grass. Posted 1915. 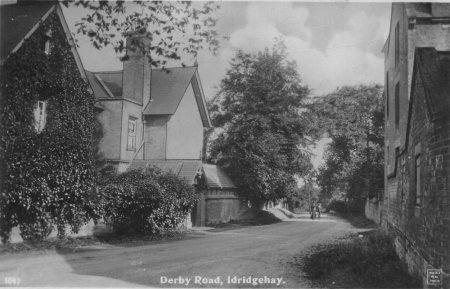 "Vicarage and Derby Road, Idridgehay." Postcard addressed to Miss Melbourne, Steeple Grange, Wirksworth. (Late 40 St John St). Dear Annie, I expect you know where this is, I thought you would like it. I will send you one of Ireton Wood House when I can get one. Yours etc, F.M. 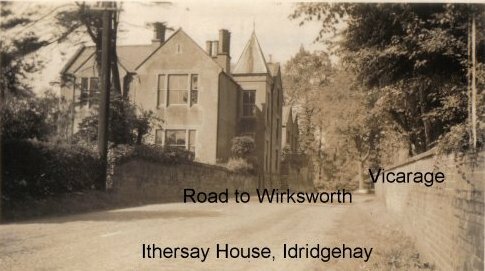 "I lived in Ithersay House,Idridgehay, Derbyshire from December 1940 until April 26, 1941 when the house was demolished by the land mine dropped from a German bomber, (dropping a land mine by parachute - hardly precision bombing!). At that time the house belonged to the Sibbald family. 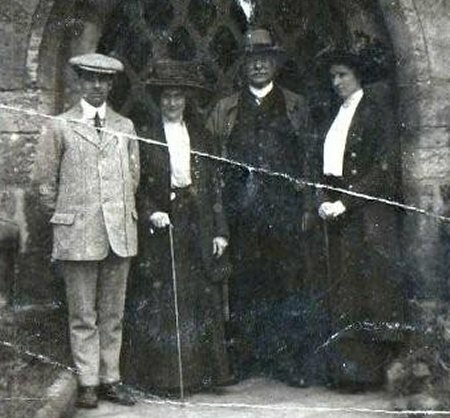 Miss Agnes Sibbald, Miss Janet Sibbald, their sister Mrs Harris and a brother who lived in Derby with his family. Miss Agnes and Miss Janet lived in an upstairs flat in the courtyard of Ithersay House, and Mrs. Harris lived in the next door house up the lane (2 cottages converted into one lovely house). Ithersay House was WONDERFUL. It had 3 stories, twisty passages and one of the small rooms on the second floor had the appearance of being much older. (I am now American and the second floor is the one above the ground floor). We were right opposite the Vicarage which was also badly damaged. Next door to us up the Derby/Wirksworth road was Cowley's Farm where we bought our milk etc. My father had an office in London and he evacuated the office and all the staff to Idridegehay. The night of the bomb - it was 11:30 at night we were conmpletely unaware of any air raid, as we were too far from the nearest siren to get any warning. None of us were killed. My brother was home on leave from the Navy and went to see if the Sibbalds were OK. Miss Janet was standing at the head of the staircase in a nightgown covered in blood!. When rescued, it was found that a fragment of glass had pierced a blood vessel in her cheek and that otherwise she was unhurt. We were, of course, very dirty - I was covered in soot and my fair hair was completely black. 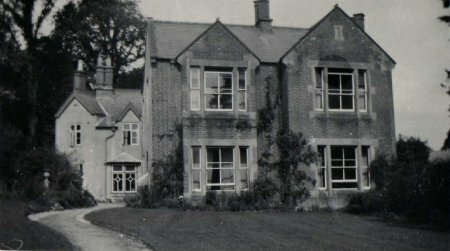 We were taken to Ecclesbourne Hall, just up the lane, where we were cared for by Mrs. Kenneth? Wheatcroft. The vicar, who was a very old man, was invigorated by the event. I had never seen him so peppy as he was on that night. I am 80 now, and because of that incident, became deaf in subsequent years. I am writing you because I do not expect that there are many living survivors of that time." Isla Keys writes: The people in this picture are probably James Murdoch Sibbald, his parents Marianne and David Sibbald (all from Idridgehay) and my grandmother, Elizabeth Taylor (from Dundee). Location of Church doorway unknown. 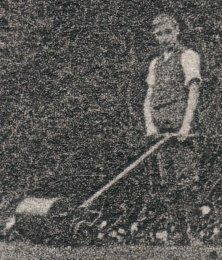 Boy mowing the Vicarage lawn. Have meant to contact you for some time... I don't have a huge amount of information, but as I live in Nottingham, decided to follow up the family often talked of by my father, Stanley Taylor (1911-1975). 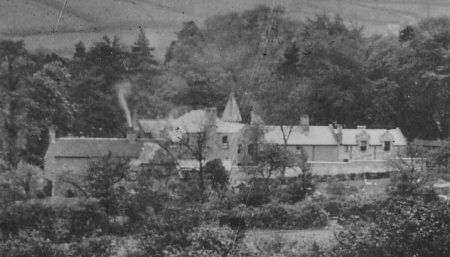 Years ago I had asked him to write on the back of family photos identifying locations etc, and I still have one of Ithersay House which he frequently visited as it was owned by his great-uncle, David Sibbald. Apparently Dad had drawn part of the house, and the drawing used to hang in a Nellie Sibbald's house (still not quite sure who she was - perhaps wife of Fred Sibbald?). David Sibbald was born in Dundee in the 1850's, and worked for the Newtyle railway there before moving south via Durham and Yorkshire to Idridgehay - I presume he continued to work with the railways but am not sure. There was a family of 2 sons - Frederick (Fred) and James Murdoch, and three daughters, Maisie, Jen and Agnes. I vaguely remember Auntie Jen. Maisie is the one referred to in Elaine Partridge's description as living in a house up the lane from the village, whereas Jen & Agnes must have lived in or around Ithersay House. Fred, I think, lived in Yorkshire, perhaps around Bedale. James Murdoch Sibbald, according to my uncle, was an accountant, and as the Sibbald firm in Derby was founded in 1926, I think he was the founder, though no-one seems to know. He did have a daughter, Vida and another one whose name I do not have. His wife might have been a Louise Leather. The David Sibbald who owned Ithersay House was the brother of Ann Sibbald, who became Ann Taylor and thus my great-grandmother. 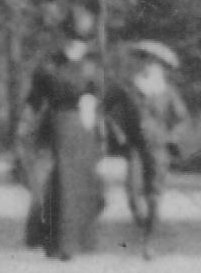 Their mother, Mary Sibbald was widowed when both children were very young, which is probably why the family remained quite close. She re-married, becoming known to the family as Granny Cunningham, and lived all her days in Dundee until her death at a very great age. I've visited Idridgehay a few times now. On the most recent visit I wandered through St.James churchyard and found the family plots - David Sibbald's gravestone is the only celtic cross there. There is a firm of estate agents in Dundee still called Graham & Sibbald, started by a cousin of David & Ann's. Other distant family members emigrated to the States and New Zealand.